Today i will be taking a closer look at the embroidery of Kalocsa. 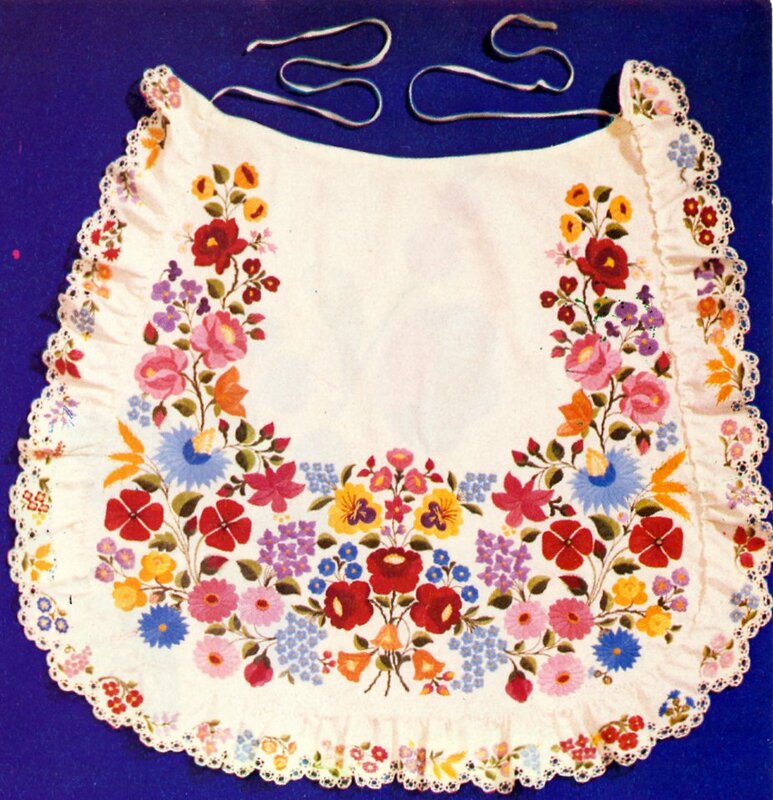 My last posting covered the costume and has more information on the location and history of the region. 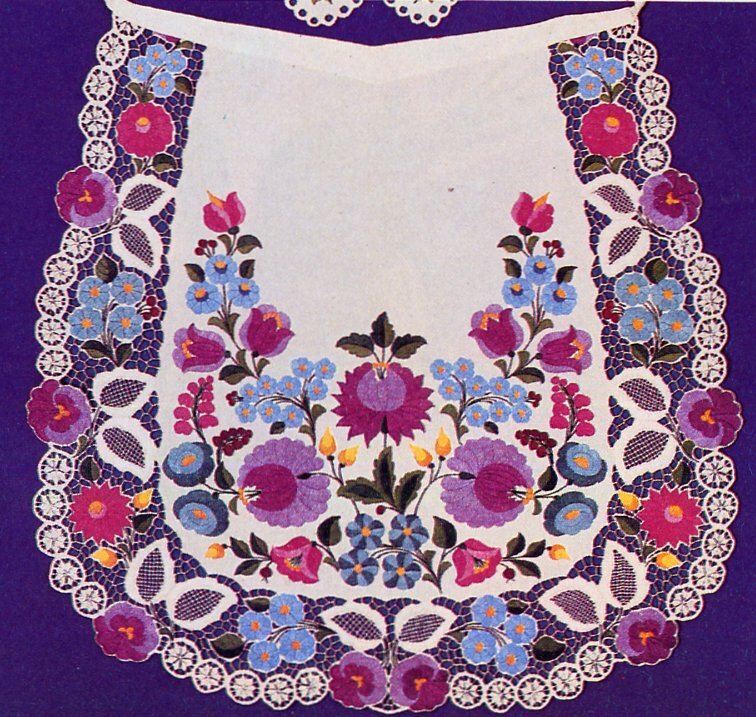 This type of embroidery is often considered to be one of the two types of embroidery which are representative of Hungary as a whole, along with the Matyo. It is, in fact, one of many regional styles of embroidery found in Hungary. 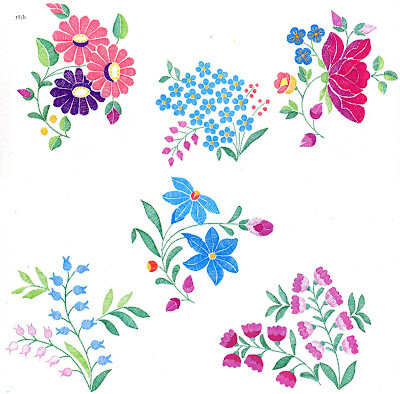 It is widely popular, as it is cursive, floral, light, colorful and cheerful. 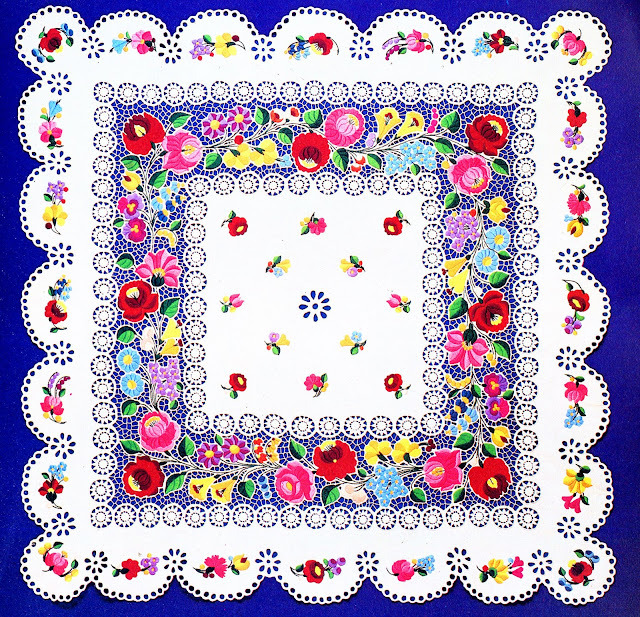 It is featured on the costume, but is also widely used on tablecloths, runners, dresser scarves, handkerchiefs, cushions, pillowcases and other items. There are, however, several variants of this embroidery which many people might not be aware of. I shall show you some of them. 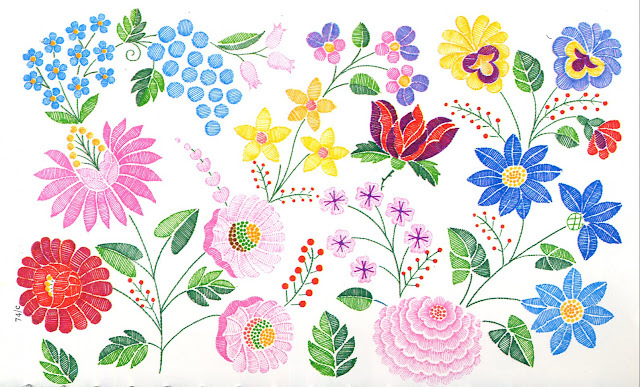 To begin with, I will present a graphing of the piece above. Be aware that the schematic is intending to show the contrasts between the shades, and should not be taken as an exact representation of the shade intended. Click on the image above to see it larger. 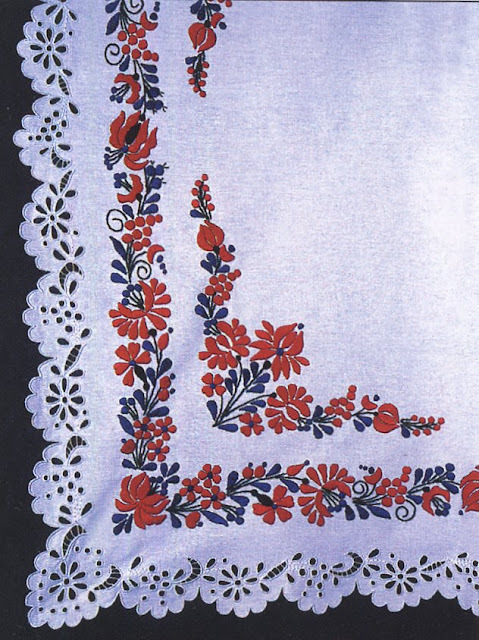 This is an unusually dense piece of embroidery for Kalocsa. Kalocsa embroidery is based on stem stitch, satin stitch and occasionally french knots, usually to indicate stamens. 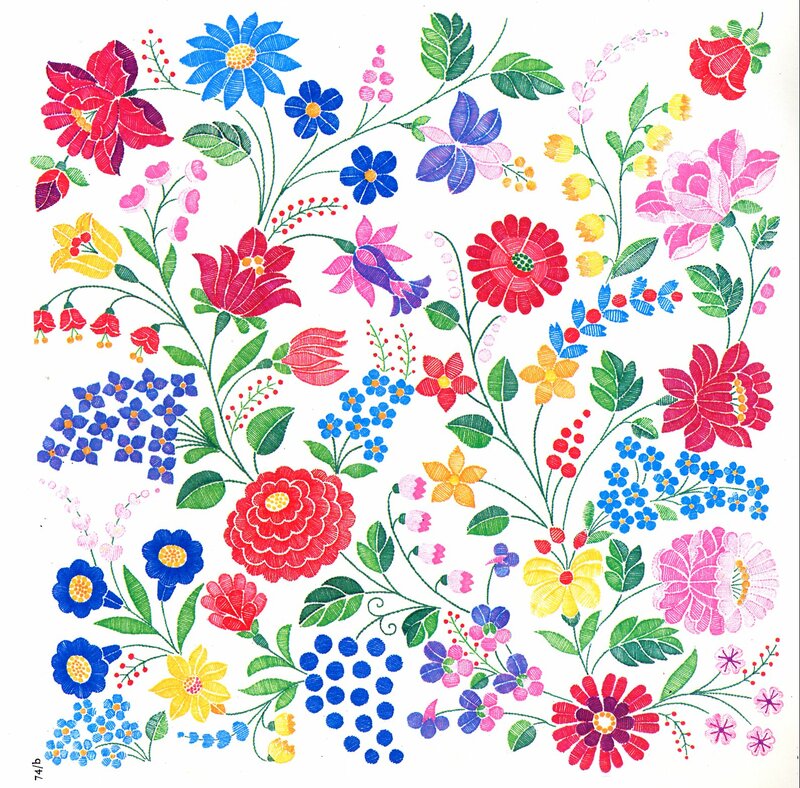 If you look closely at Kalocsa embroidery, you will see roses, lilies, forget-me-nots, fuchsia, carnations, morning glories, zinnias, chrysanthemums, daisies, gentians, daffodils, peonies, violets, cornflowers, pansies and others, including wildflowers, which i do not know the names of. 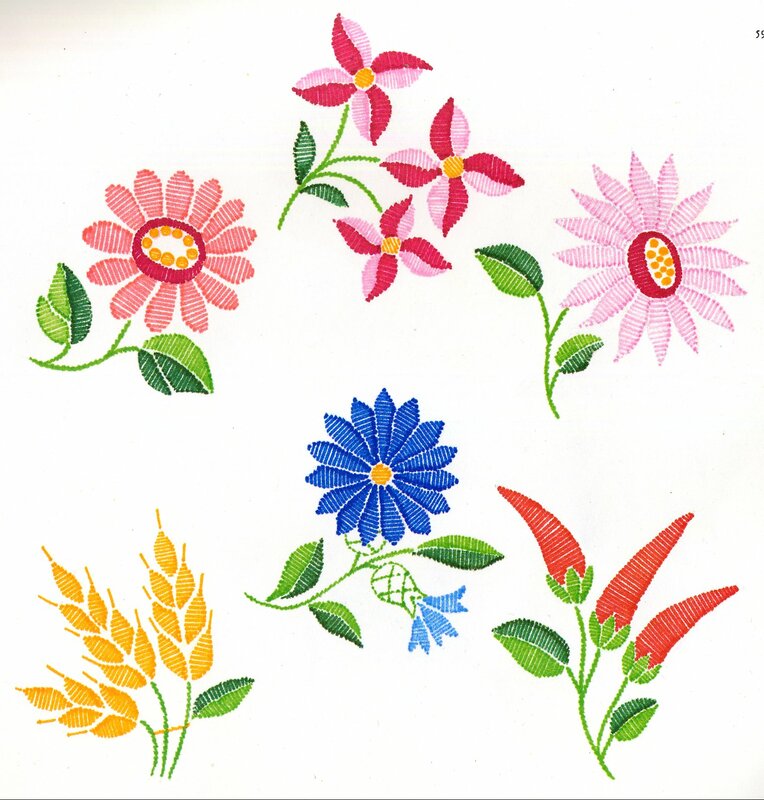 Also included are motifs which might be berries, as well as ears of wheat and paprika peppers. 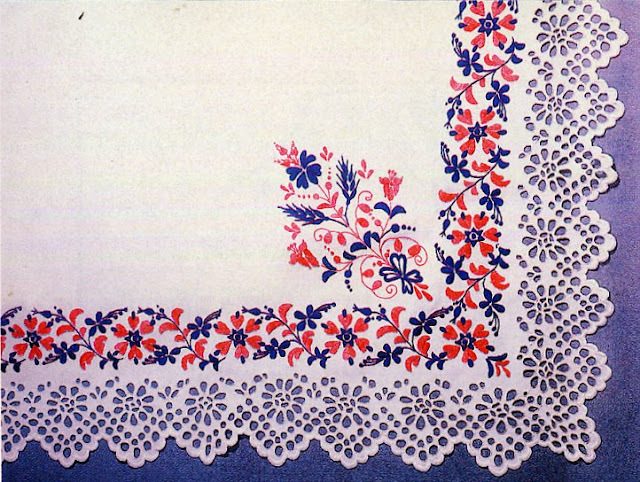 It is not uncommon to see small sprigs used as isolated motifs on scalloped edges or scattered across a field. I do not believe that i have ever seen a piece of this type of embroidery with a straight or hemstitched edge, rather the edges are always worked with some degree of openwork. 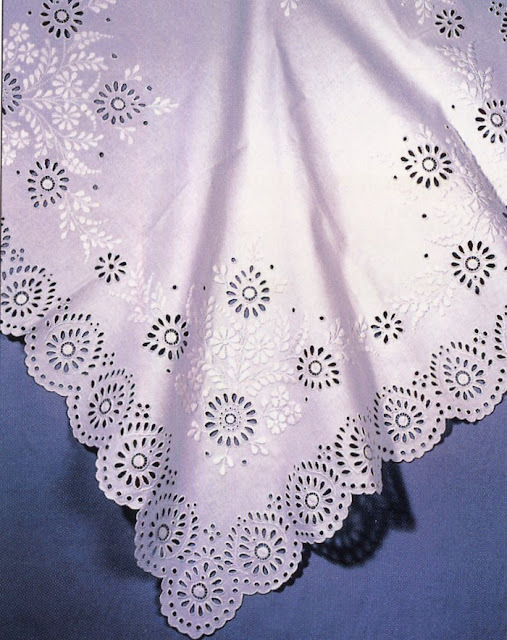 The older style is to use Broderie Anglaise cutwork. This is still done. More recently, Richelieu embroidery was introduced into this region, and it was enthusiastically received. In Hungarian it is spelled riseliő, but pronounced the same. 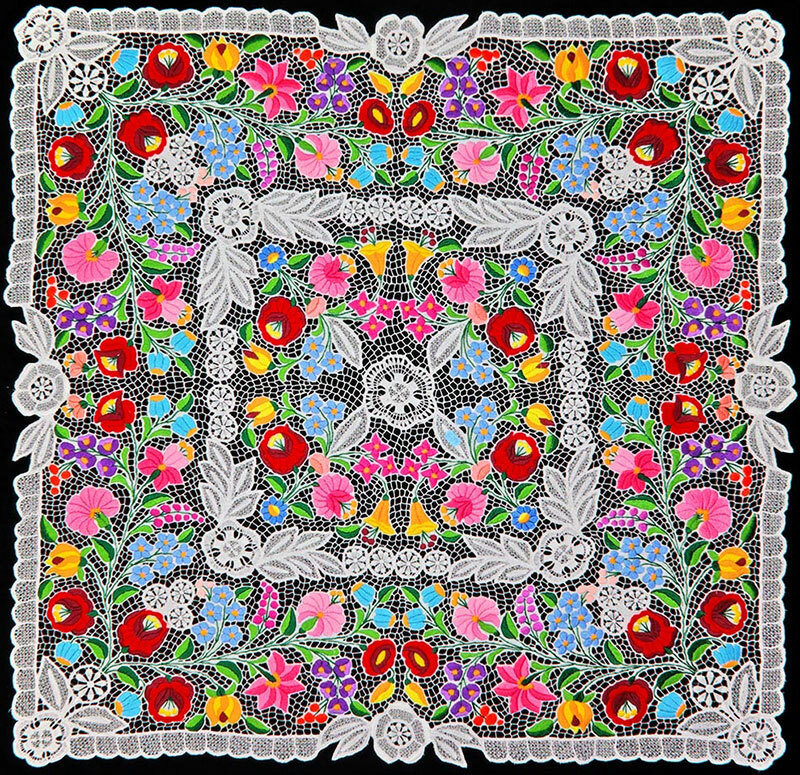 As done today, Kalocsa embroidery uses 27 colors, and has a set vocabulary of motifs, which are sufficient to make it a recognizable style, and yet leave room for limitless rearrangement into ever new compositions. The traditional colors are used on the costume, and because central parts of the motifs are based on red, orange, and pink, they are called 'happy colors', and are considered to be appropriate for girls and young women. 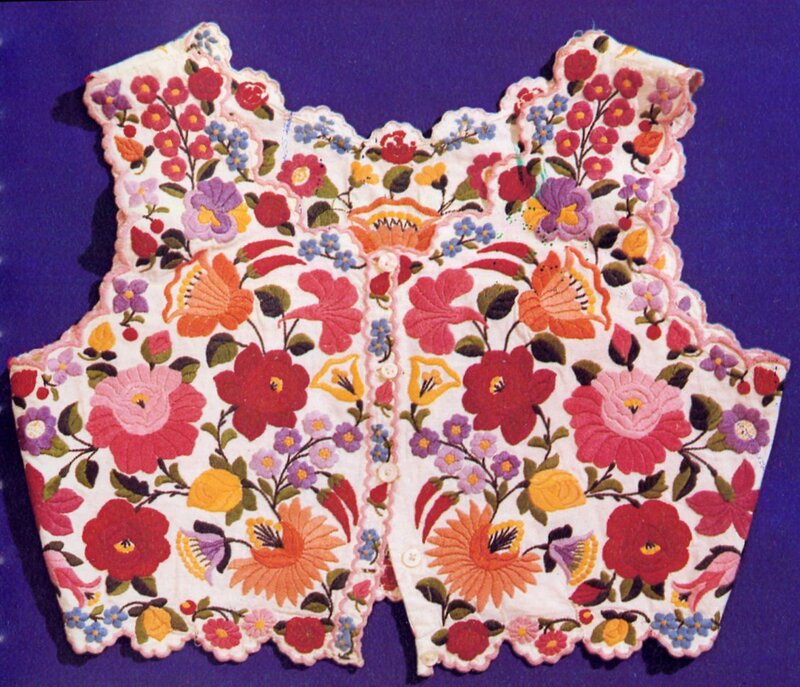 A good example are this bodice/vest and apron. As in many cultures, this was not considered to be appropriate for widows or women 'of a certain age'. 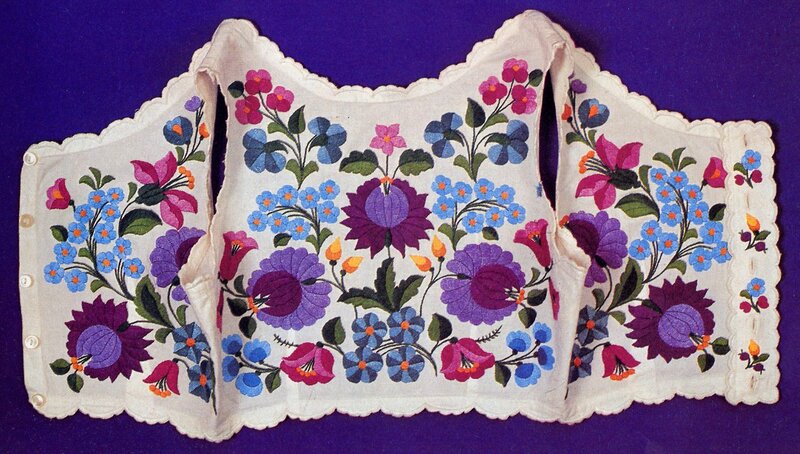 In theory, one then made new embroideries which replaced red, orange and pink with violet, purple and lavender. Here is an example. In actual fact, this tradition is more commonly honored in the breach, and the women tend to follow their taste. 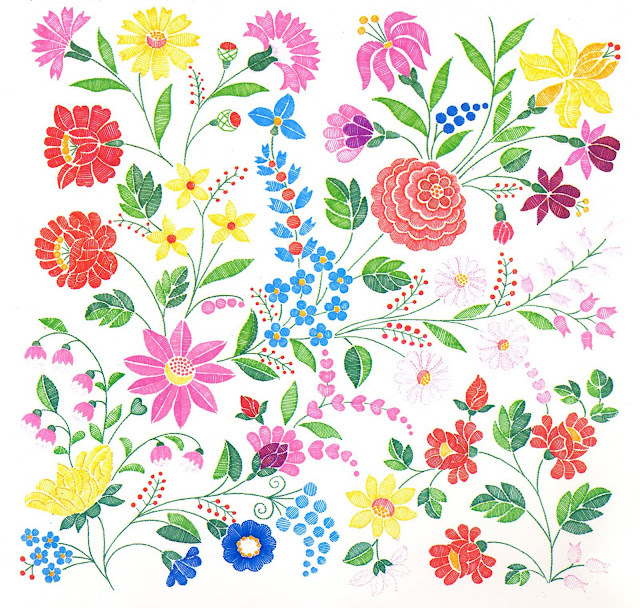 There are many beautiful pieces made in the 'sad colors'. My sources claim that this embroidery was originally done in white on white, and it still sometimes is today. Look at this beautiful tablecloth combining it with broderie anglaise. Somewhat more recent is the work done in two or three colors, red and blue, black and blue, or red and black, or all three. 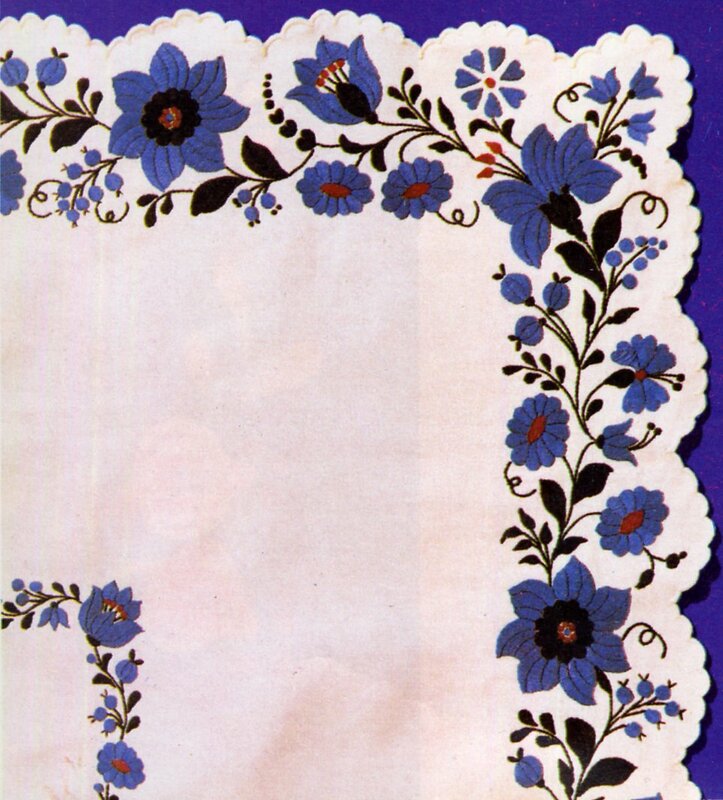 These sometimes have a stiffer, more formal arrangement than what we see today, but are also quite attractive. Then there are some pieces done in pure riseliő style, see the apron in the previous posting. I hope you have found this interesting. 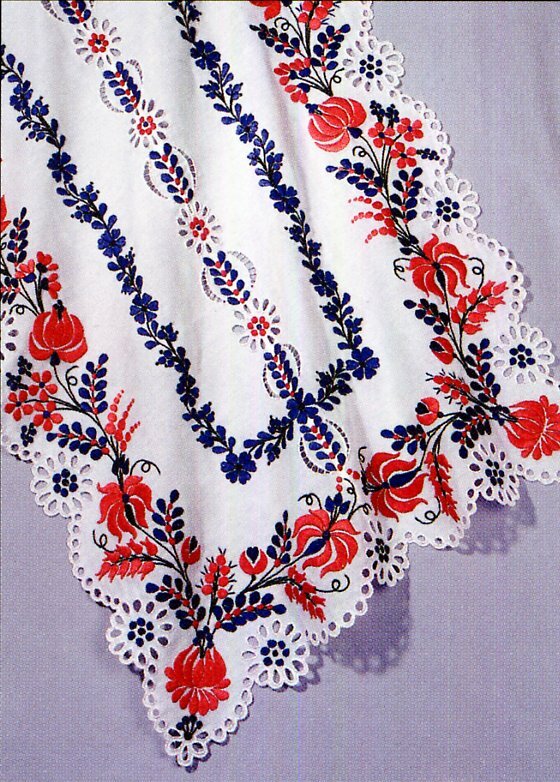 Why not take the motifs of Kalocsa embroidery and make something that will beautify the world around you? 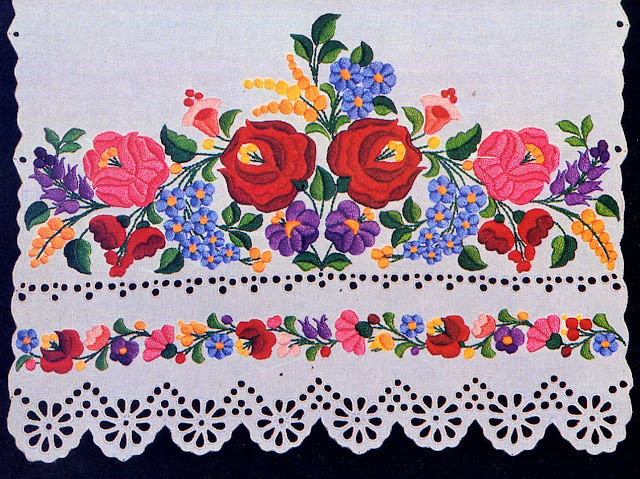 I find it inspiring that peasants, who had such hard lives, would make things to use, and would take the time to make them beautiful. Today we consider ourselves to be better off, but we surround ourselves with mass produced things with little character and no creativity or uniqueness. Here are two last elaborate, inspiring examples. 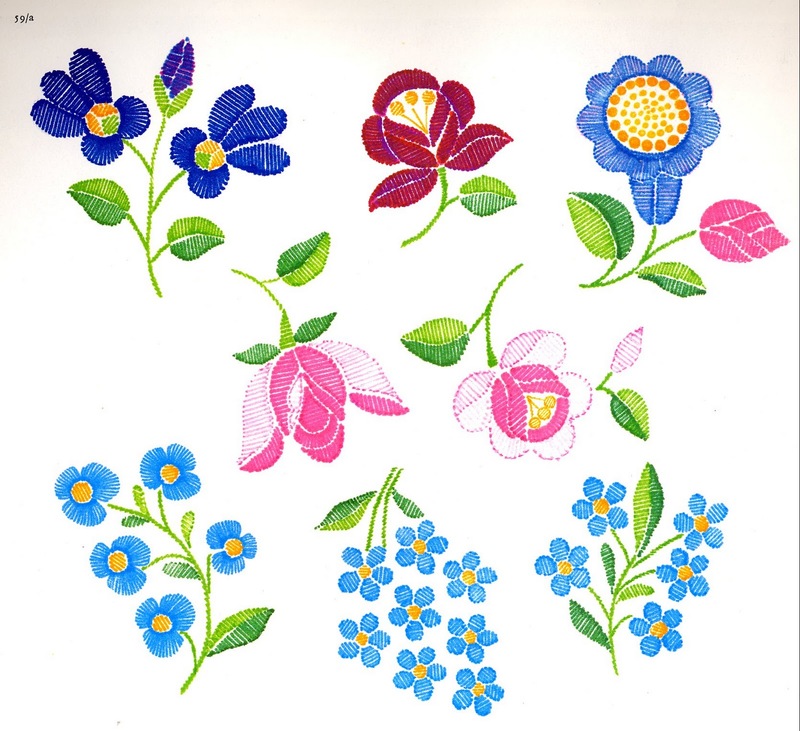 Go and make something beautiful. Here is a website about Kalocsa embroidery which features various articles for sale. 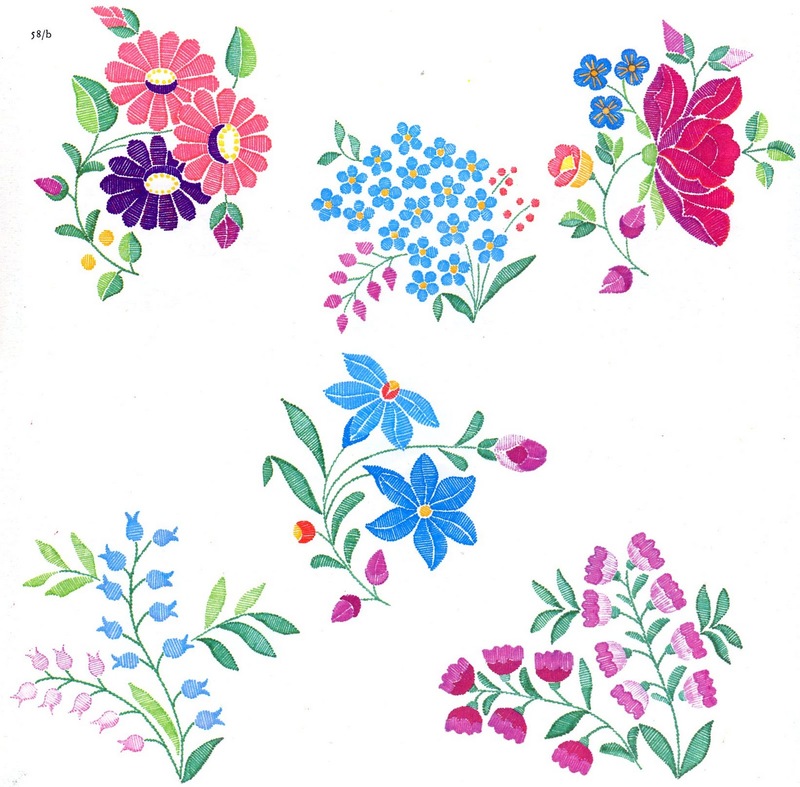 She also gives some background and shows off her own work. OMG you are amazing Roman. Thank you so much for all the work you do on your website, just amazing and such a resource! loved your blog and such detailed discriptions..The embroidery is truly gorgeous and inspiring..
Wow ooohhhhh how beautiful please how can I order a couple of these?? Thanks for your great work! i am Hungrian , teaching Hungarian embroidery, and find your work, specially photodocumentation so USEFUL!!!! greatings from Japan!!! 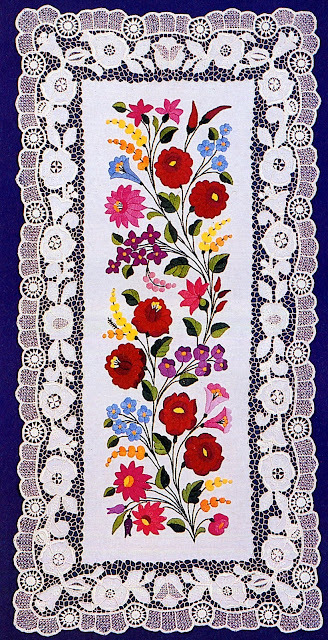 I am looking for a pattern of hungarian embroidery to do a Christmas stocking for my daughter. Could you point me in the right direction or offer any suggestions please? I also am hungarian. judypandy3@gmail.com.